On the hard is an old sailors term for putting ones boat on dry land and out of her element. Sometimes this is necessary not only for painting the bottom to ensure a smooth glide through the water with unwanted passengers that are quite crusty and adverse to travelling fast i.e. Barnacles and other slimy monsters of the ocean but also to repair or replace items that are not quite working properly. 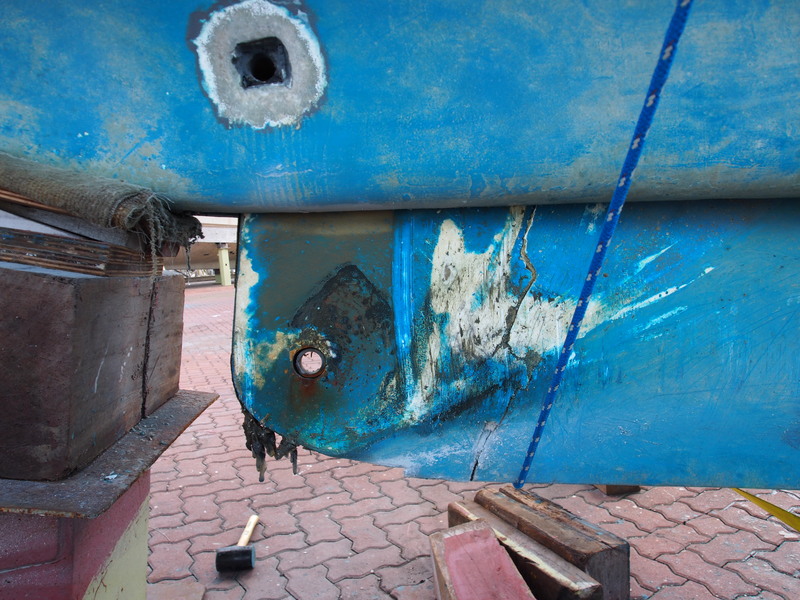 The major reason for us to haul out now is to fix a damaged centreboard. We have been sailing the last five months with the centreboard tucked up into its housing as knew it was damaged and did not want to make the situation any worse than it was. 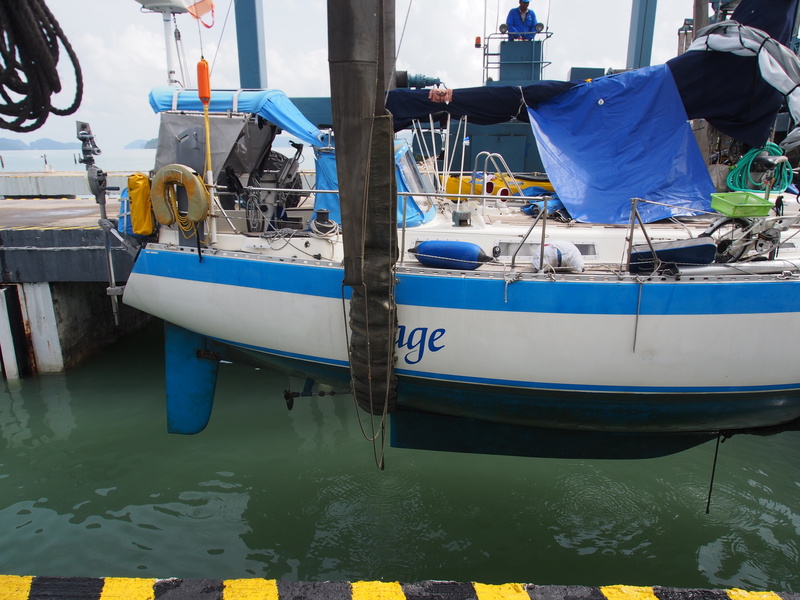 We have now hauled out at Boustead Shipyards here in Langkawi. We live onboard while we do the work and there is lots to keep us occupied. We do have a beautiful view from our cockpit overlooking the entrance to Kuah Harbour. We watch all our new found friends sailing in and out either on their way to, or back from, either Thailand, Indonesia, Singapore or other areas of Malaysia. The view is better than other workyards we have been in but it is still a ‘WORKyard’ and as the clock ticks we have to keep working. Back to the centreboard. 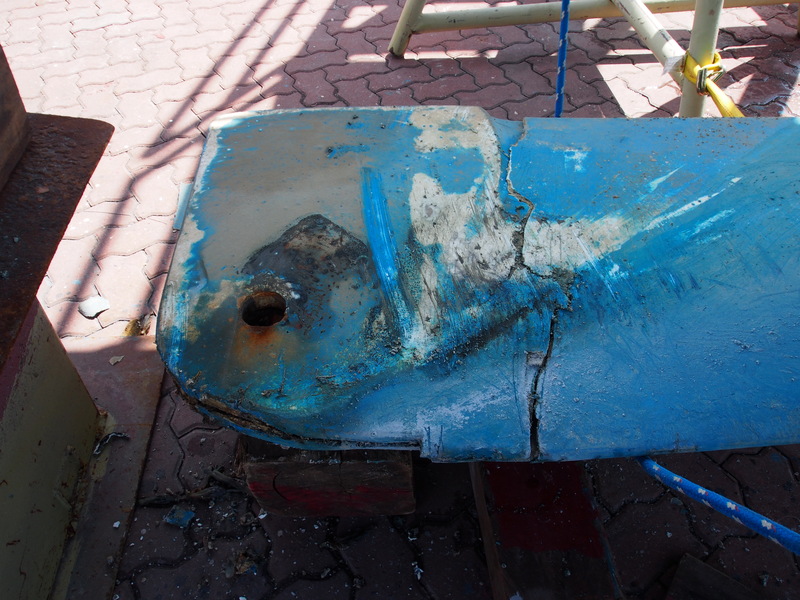 As you can see from some of the photos the centreboard delaminated and is cracked. A hell of a job to repair but we have started. We hope to be back in the water in a few weeks so stay tuned! Oh dear! That doesn’t look good at all. I know you’ll make it better than new. Having a marvelous honeymoon in Chicago while we await your next report. Yikes. Now that’s a reality check for you! Here I am all worried how I’m going to get into San Francisco and to work this morning, what with BART on strike and some 400,000 people a day looking for alternate transportation in from the East Bay. It’s a royal pain. But a crack in the keel…that’s actually important. Good luck with the repairs and Gods speed. I hope it all comes together fast so you can be out of the Yard and back at Sea. It looks like a big job Tony. How far down do you have to go before can start rebuilding. Has it got a wood core and classed over or is all glass. Have you now got used to the AC unit, I hope that is working out well. When you get underway do you have to stow the AC? Happy belated Canada Day !!!!! 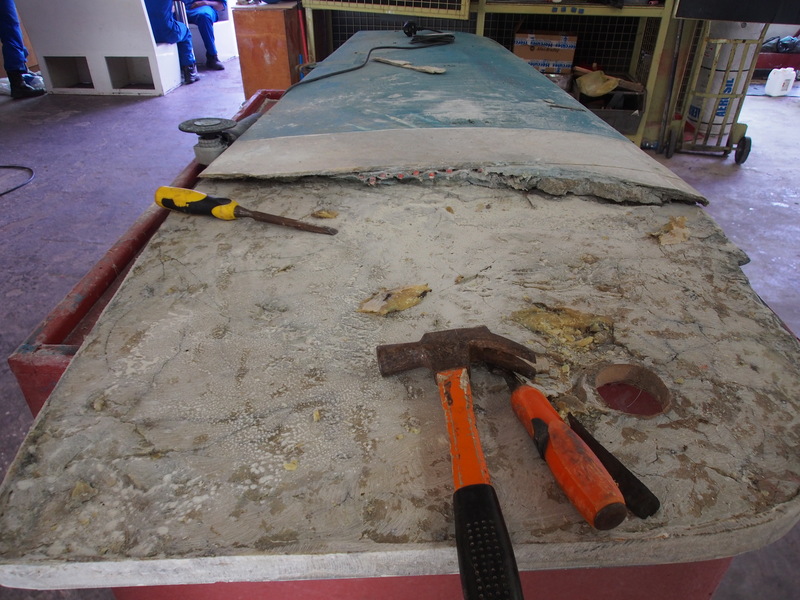 The centreboard is not cored but rather straight fiberglass. The aircon is too big to keep stored. It will be sold to the next person to stay at the dock in this heat! Good luck with the repairs. Looks like a lot of work in the heat. Glad that you have the A/C and sleeping better at night I bet.